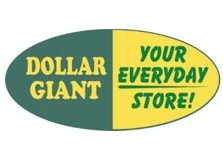 Dollar Giant is now Dollar Tree Canada! We’re working hard to create an environment where shopping is fun…and we continue to offer our customers the products they need at extreme values! We carry everything you need for every day, every holiday, and every occasion… and every single item is affordably priced at $1.25 (or less).